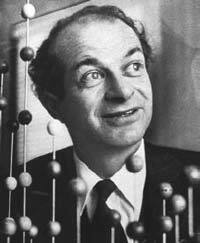 Linus Pauling made important contributions in chemistry, mineralogy, the structure of proteins and many other biologically important elements, quantum mechanics, nuclear structure, the nature of mental disorders and nutrition. He was the first to note the alpha helical structure of proteins. Using electron diffraction techniques, Pauling determined the molecular structure of more than 225 substances. Above all, he is the first person to ever receive two unshared Nobel Prizes. Pauling was born in Portland, Oregon in 1901. His father, Herman Henry William Pauling, was a druggist and his mother Lucy Isabelle Pauling was the daughter of a pharmacist. His parents always encouraged him in his scientific interest right from the beginning. His family struggled very hard to make a living and they moved frequently. Pauling’s interest in science was stimulated by one of his friends, Loyd Jeffress, during his days in school. Jeffress had a small laboratory in his bedroom where he would do simple experiments. Pauling was very much intrigued by the experiments done by Jeffress and this played a big role in his deciding to become a chemical engineer. When Pauling’s father died in 1910, his mother found it very hard to run the whole family. So, to support his family and his studies, Pauling worked long hours and did odd jobs like delivering milk, working in a machine shop and washing dishes. In high school, Pauling pursued his interest in chemistry by doing experiments on materials abandoned by a metal company. In 1917, Pauling joined Oregon Agricultural College where he learned about the chemical and physical properties of substances and how they are related to the structure of atoms and molecules they are composed of. In 1922, Pauling received his Bachelors degree. In 1923, Pauling married Ava Helen Miller, and later had 4 children. Pauling was awarded a doctorate in chemistry in 1925 by the California Institute of Technology. After graduation, Pauling travelled to Europe for two years and studied the new field of quantum mechanics. He was appointed as an assistant professor at Cal Tech for theoretical chemistry. He stayed in this position until 1963. Also, between 1937 and 1958, Pauling headed Gates and Crellin Chemical Laboratories. The main theme of Pauling’s work was to understand the properties of chemical substances based on their structures. He then began to determine the chemical structure of various inorganic compounds and tried to understand the rules that govern the structures of these chemical compounds. During mid 1930’s, Pauling stared to work on the structure of biological molecules like hemoglobin. His discoveries led to the first documentation of a disease called sickle cell anemia. In 1957, Pauling organized for a petition calling to end nuclear testing, as he found that nuclear testing can cause irreparable damages to the human population. He was even punished for his views, but nothing could keep Pauling from protesting, speaking, writing, and organizing meetings against militarism. The use of Vitamin C in the prevention of the common cold was studied by Pauling in 1966. He also summarized his views in a book and published it. Pauling suffered from cancer and died in 1994. Since his death, research continues on all the aspects of his earlier discoveries, particularly on vitamin C.